I have always loved Halloween mazes and slasher horror films. 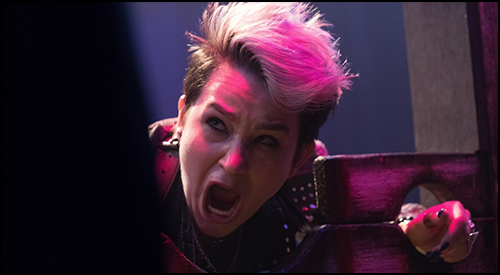 I had the opportunity to combine those thrills by scoring the new Lionsgate / CBS Films feature, Hell Fest, which opened theatrically last weekend. For anyone who has been to a Halloween maze, this film’s central premise is quite disturbing. 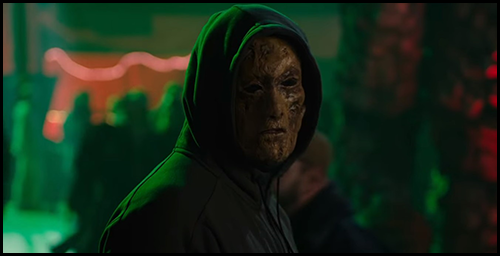 Structured like a classic slasher, the story is about a group of teenagers who go to a traveling Halloween maze, Hell Fest, only to become the latest prey for a masked killer who continually strikes and then disappears into the crowd of costumed freaks. Hell Fest allowed me to work again with several of my favorite creative partners, including director Gregory Plotkin, with whom I collaborated as the editor on last year’s phenomenal Happy Death Day, and Gale Anne Hurd, the inspiring producer who brought me on board The Walking Dead nearly a decade ago. From my earliest creative meetings with Greg, it was clear the film would require an iconic theme for the killer. This philosophy was guided by the memorable scores of the classic 1980’s slasher films to which Hell Fest pays homage. 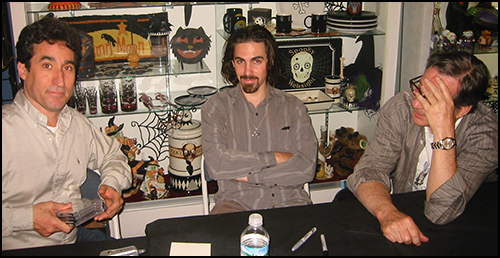 Thematic writing was important to Greg and I because we wanted the score to nod to the past, but also feel contemporary. For the score to function, to genuinely scare the audience, it had to be more than just a throwback nod to the past. It needed to be simultaneously classic and modern. To realize this concept, I combined two musical ideas: gritty synths, and a large orchestra. Initial sketches of the theme were performed on a synth. Greg felt, appropriately, that the homage to the 1980’s was going too far, however he liked the melody conceptually. Realizing the wisdom in that note, I circled back to him with a new variation, this time replacing the synthesizer colors with solo violin harmonics, with digital processing masking the sound’s acoustic origins. With this combination, the theme felt old-school in its melodic simplicity, but modern in its performance and effects. This sound clicked instantly, and the theme for our killer was born. As with classic slasher films, this simple theme lurks in the shadows throughout most of the film, sometimes accompanied only by ambient reverb, and at other moments supported by massive synths, percussion, creepy male vocals, and in the film’s closing sequences, muscular orchestration. A melody this simple can be extremely effective in just about any musical setting imaginable, which allows it to grow with increasing menace as the narrative progresses. The creepy solo violin and low-end synths were just one component of the Hell Fest sound, the other being the massive symphonic contributions from the Synchron Stage Orchestra in Vienna. With the symphonic layer of the score, I was able to push the musical boundaries beyond the synth-heavy homage to 1980’s slashers, and write a contemporary, expressive horror score. Leaning heavily into the amusement park aesthetic, the orchestral layers are at times heavy and ominous, brisk and playful, or quirky and disturbing. Some of my favorite moments in the score are when the celli and basses take over that violin harmonic theme and turn it into giant, foreboding footsteps stomping towards us. As I was unable to travel to Vienna for the recording session, I am especially grateful to conductor Johannes Vogel for immediately understanding my musical intentions, and providing graceful leadership during fast-paced sessions. The score to Hell Fest was a delightful challenge, however my earliest meetings with Greg made clear there were more musical challenges in store. 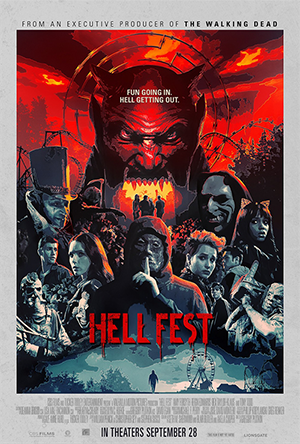 Hell Fest actually required two layers of music: narrative score, and amusement park source music, with each distinct area of the park having its own musical identity. The requirements of the source music varied from scene to scene. Sometimes, it had to provide a mood in the background, and on other occasions, it had to subtly shift to score-like narrative, and on a few occasions, the source music needed to blend seamlessly into a full score cue and back. Some of these songs could clearly be licensed from pre-existing libraries, but a bunch of it clearly needed to be crafted from scratch for the film. Excited by the prospect of scoring a theoretical amusement park, I leapt at the opportunity contribute additional source songs. This idea effectively doubled my workload on an already compressed schedule, but I was too fired up to resist. Besides, I knew some wildly talented composers I could reach out to for help. Early in the film, our characters wander through the ‘Killer Clown Scare Zone’ area of the park. As Greg and I discussed what music would play here, our mutual love of Killer Klowns from Outer Space came up. I had just recently attended an amazing anniversary concert of that film and score, produced and conducted by my friend John Massari, so I proposed to Greg that we bring in the guy who actually scored the original classic we were paying tribute to. While John explored some of the park’s themed areas, I reached out to my brother, and frequent creative partner, Brendan McKian, to pitch ideas for some of the park’s more electronic music. The first piece he tackled was our entrance into Hell Fest, an energetic sequence that concluded with a huge rave at the center of the park. He also scored a couple of the mazes, and let me include a few songs from his new heavy metal band on the soundtrack album, because they fit the vibe of the album so perfectly. Tackling a score and song collection like this is obviously a huge group effort, and I want to thank everyone who contributed their time and energy to making this score a reality. Special shout-outs are due to Laura Engel from Kraft Engel Management, my entire team at Sparks & Shadows, especially Joe Augustine, Kaiyun Wong and Marisa Gunzenhauser, mixing engineer Ryan Sanchez, orchestrators Ben Hoff, Jamie Thierman, and Sean Barrett, and Jason Akers, Omer Ben-Zvi, Sam Ewing, and Kevin Lax, who all contributed terrifying additional score. Rounding out the amusement park songs, I donated some of my older material that fit the aesthetic. One of those cues is a sketch I wrote a few years ago called “Tears of the Demon.” Hell Fest marks this track’s first official soundtrack release, although it did appear once before in a project I scored. Can any eagle-eared fans remember on what other project I used it? 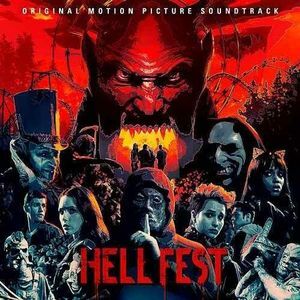 Speaking of the soundtrack, I’m thrilled to say that the Hell Fest soundtrack album is available now from my label, Sparks & Shadows, on all streaming and download platforms, including iTunes, Amazon and Spotify. When I was a kid, I always loved playing film soundtracks at Halloween. My goal here, in assembling the album for Hell Fest, was to create a track list worthy enough be included in film fans’ playlists this Halloween season. The album leaps between creepy ambient score, bombastic slasher music, amusement park source songs, and upbeat electronic tracks. My hope is that someone out there plays this album this year at a haunted house, using it to terrify neighborhood kids as they reach towards a Jack-o’-lantern for candy. Halloween season is finally upon us, and I’m so excited that Hell Fest is out! Speaking of scares, I hope you all had a chance to check out the ninth season return of The Walking Dead last night on AMC. This season is a game-changer on many levels, including musically, where I’ve had the chance to reinvent the sound of the score to a surprising degree. I think fans will be very pleasantly surprised by the direction the series takes in the coming weeks. Hang on for a dramatic ride!